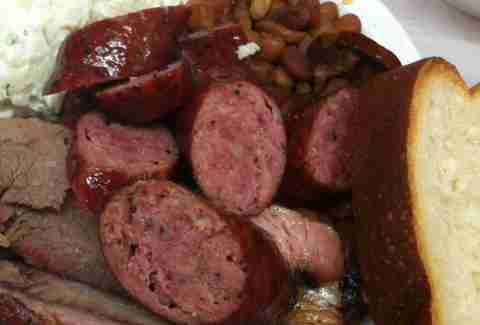 Two universal truths about Texas: it’s big, and it’s full of smoked meat. 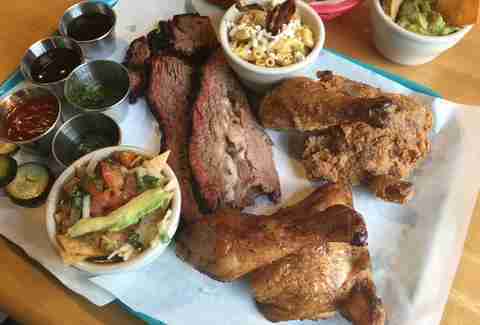 Barbecue joints big and small cover the state -- some estimate we have more than 2,000 -- so even a few good ones are sure to get lost in the shuffle. Many of the same names show up on every one of the “best-of” lists, and sure they’re legendary joints that deserve the praise they get, but that leaves little room for new names to nudge their way in. The result is plenty of underrated barbecue joints. As the country’s (world’s?) 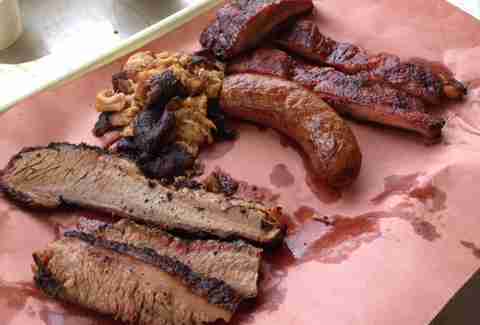 first Barbecue Editor, I travel the state for Texas Monthly looking for great barbecue. 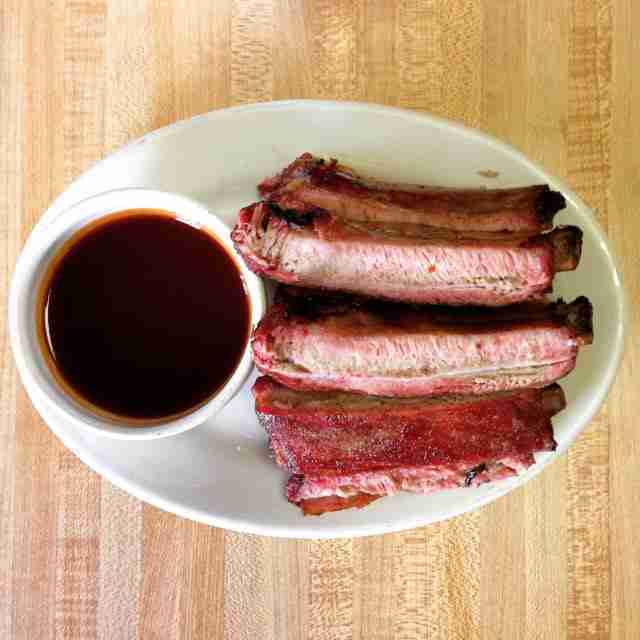 I write about most of it, and we do our share of those “best-of” lists, too, including our roundup of the 50 best barbecue joints in the state, which comes out every four years. With so much great barbecue in Texas, some deserving joints get left off and with so much time between lists I’ve had plenty of time to discover new spots since the last one was released. None of these underrated joints are in that current Top 50, but they’ve all got a shot at the next one. No matter, they’re all worth a visit whether you’ve heard of them or not. This East Texas barbecue chain has been around since the sixties, and you’re still apt to find founder Roland Lindsey here at the original. There’s also some new blood as his son-in-law Jordan Jackson took over the pits in June, and the barbecue is better than ever. You won’t find a big menu, but what’s there is spectacular. Sweet ribs and some of the best brisket in East Texas come alongside specials like monster beef ribs and house-made sausage. Don’t miss the free beans in a big pot near the door. Billy McDonald grew up in his father’s barbecue joint, but it’s been all his for decades. Just like dad, he seasons his meat with nothing but hickory smoke. It’s an old school attitude that matches the décor of the yellow cinder block building. Weekday lunches are your only option to get the tender pork ribs or a sandwich piled high with chopped brisket and jalapeño sausage. Just get there soon because Billy is looking to retire and has the joint on the market. Patillo’s is the oldest barbecue joint in the state with black owners, and the oldest owned by the same family. Robert Patillo still serves the family’s signature beef links, the same as they did when they first started selling them in 1912. Despite the long history, Patillo’s isn’t nearly as celebrated as the joints in Central Texas. 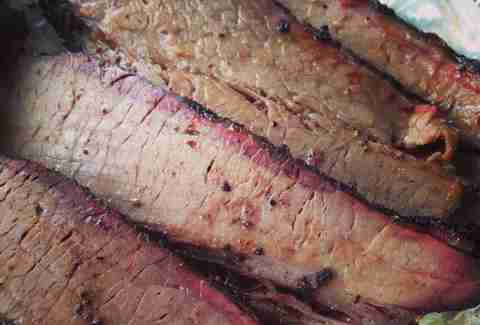 Blame it on being stuck in the southeast corner of Texas, and also not putting much emphasis on smoked beef. 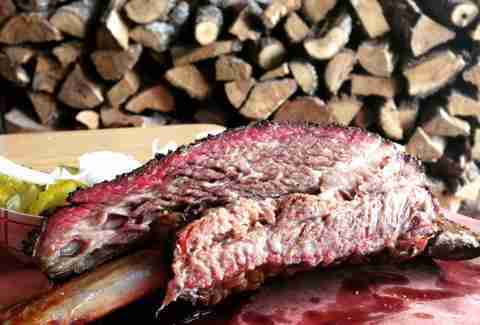 Its brisket or shoulder clod might be on the menu depending on the current price, but stick with the links. They’re worth the trip. The 300+ mile stretch between Fort Worth and Amarillo is basically a barbecue wasteland. The towns are few and far between, and don’t have much more than a gas station and an Allsup’s grocery store. 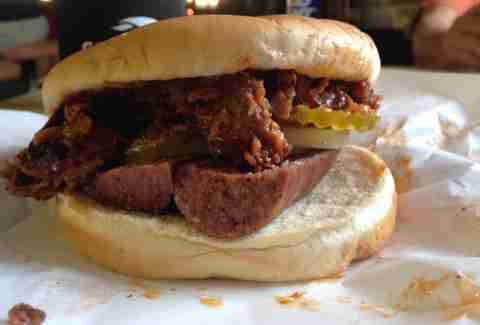 Wichita Falls is the exception, which is where Prine’s Barbecue has made their home since 1925. 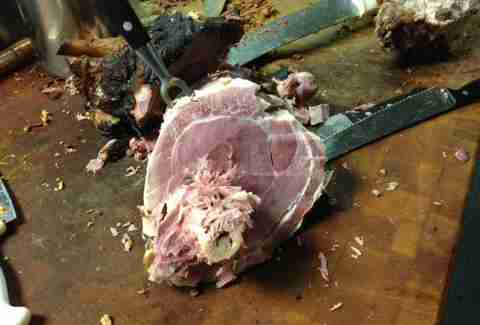 Allen Prine is the third generation pitmaster whose specialty is smoked, bone-in hams. The chopped beef sandwich is a good option, too, made even better by a scoop of the restaurant’s pimento cheese. Barbecue is only the start at this joint in the Lower Rio Grande Valley that might just have the most dynamic menu in Texas barbecue. Lusciously fatty brisket shares space with smoked/fried chicken, smoked fish tacos, and some of the best tortilla soup you’ll eat. All the meats can be ordered as tacos (brisket and pulled pork are both perfect in that role) and come with an array of salsas from Chef Stefania Trimboli-Wright. The creativity doesn’t stop with dessert. You might find a slice of margarita grapefruit pie when in season. 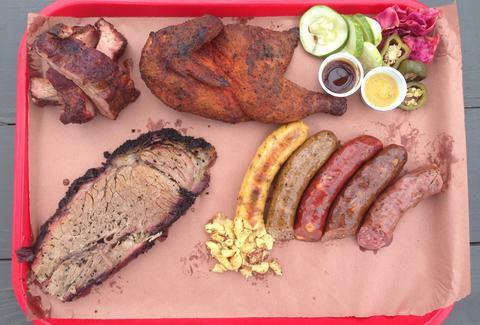 East Austin is one of the best neighborhoods for barbecue in the country. The infusion of new blood with spots like Franklin Barbecue, Micklethwait Craft Meats, and La Barbecue helped make it famous, but before any of them opened there was Sam’s. The brisket is best chopped, and the pork ribs are hit or miss. 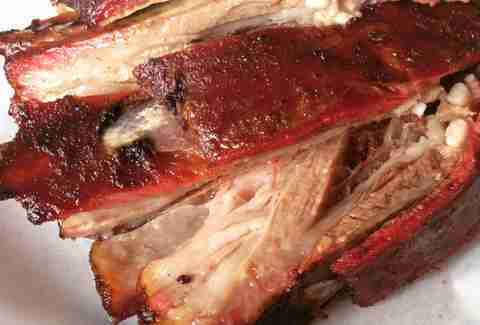 Then there are the lamb ribs, a Texas barbecue delicacy. Tender, fatty, and salty; a little gaminess gives this cut its signature flavor, and Sam’s has some of the best in the state. A trailer sits out front of Smokey Denmark’s sausage factory serving lunch during the week. Sure, there’s brisket, beef sausage, and pulled pork on the menu, but venture deeper. You’ll find more unique items like smoked chicken with Alabama white sauce, smoked boudin, and occasionally you’ll get smoked jerk chicken. Check the chalk board for daily specials and you might snag a corned beef taco or macaroni & cheese sausage (you read that right). Smokey Denmark is full of surprises, and most of them are good ones. It’s odd that the oldest barbecue joint in the state could be underrated, but even with solid barbecue it doesn’t get nearly the attention of its Central Texas brethren to the north or south. Started in 1882, Southside Market isn’t resting on its laurels. 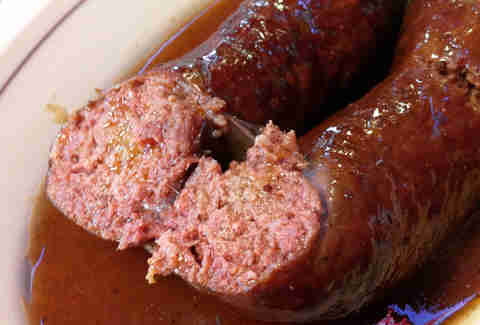 They’ve just opened a second branch in Bastrop, but no matter which location you choose, it’s all about the hot guts. Those are the famous spicy beef sausages that are the most popular menu item. 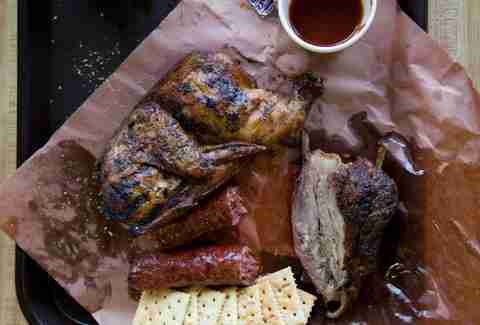 Besides that you’ll find juicy smoked chicken and the specialty lamb ribs that aren’t easy to find in Texas. Down by the tracks and under the overpass is historic Taylor Café. Now overshadowed by the better known Louie Mueller Barbecue in town, it still holds its own as the best bar for barbecue. Vencil Mares opened this place in 1948, and although he doesn’t do much cooking these days, he’s a fixture at the end of the counter. Come for the turkey sausage, the cold beer, and the conversation. Don’t forget to bring cash. A barbecue joint in an urban strip mall doesn’t elicit the expectations that some secluded, roadside shack might, but this one is worth exploring. Owner Wayne Kammerl got his education in College Station and has brought a taste of it to Houston with jalapeño sausage from Ruffino Meats. 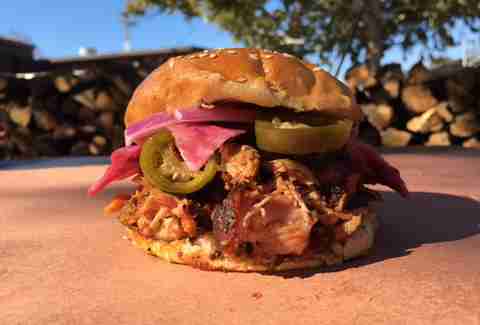 It’s the lynchpin in his PB&J sandwich which also features pork and brisket. It’s the beef short rib that should not be missed. A pound of tender, juicy meat barely clings to a bone the size of a child’s arm, so find someone to share it with. Unless you’re on your way between Wharton and Sealy, East Bernard isn’t really on the way to anywhere. Vincek’s sits at the main intersection in town and serves as restaurant, meat market, and deer processing facility. Owner Gary Vincek cooks a mean brisket, but he’s known more for his garlicky Czech-style sausage, which is still made with the 200-year-old recipe of his Moravian ancestors. They bake as well as smoke, so you won’t find cheap white bread here, and the fruit kolaches are made in house. Daniel Vaughn is the Barbecue Editor at Texas Monthly and TMBBQ.com. He is also the author of The Prophets of Smoked Meat; A Journey Through Texas Barbecue. He has logged tens of thousands of miles on the highways and backroads of Texas and eaten at over 1,000 barbecue joints across the country. You can always find him on Twitter @BBQsnob.